Pianist Arthur Athan, the 2015 ACVC Open Instrumental Winner, also received the John Hopkins Performance Fellowship Award which gave him the opportunity to play with the Barrier Reef Orchestra and one other orchestra in Australia. 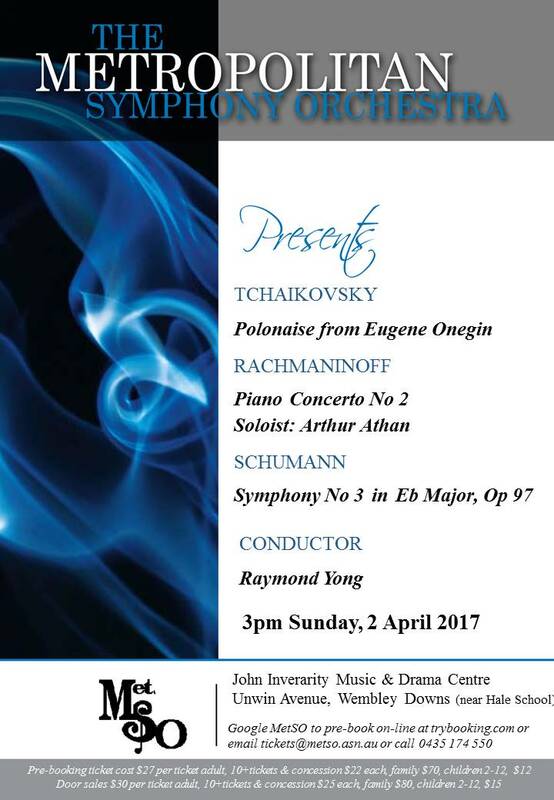 His concert with the Barrier Reef Orchestra was held in July 2016; next month he will perform the Piano Concerto No2 by Rachmaninoff with the Metropolitan Symphony Orchestra in Perth. The conductor will be Raymond Yong who is well known to Townsville audiences. Our President Cris Dall’Osto, Carol Dall‘Osto and their friend ACVC member Sam Spina from Ingham will be attending the concert and, while there, Cris hopes to be given the opportunity to say a few words to promote this year’s Competition. He also hopes he may find out current information about cellist Carol Paget from Perth who won the ACVC Open Instrumental Section in 1992.